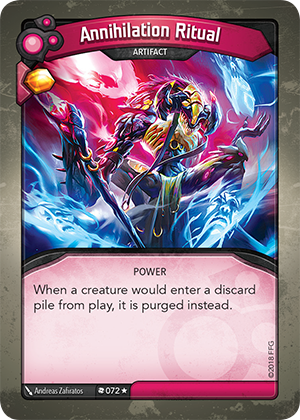 Card Text When a creature would enter a discard pile from play, it is purged instead. Does Annihilation Ritual negate the effect of a creature’s “Destroyed:” ability? No. “Destroyed:” abilities are resolved immediately before a creature is destroyed and before it leaves play. Annihilation Ritual’s ability triggers when a card has already left play and would enter the discard pile. Therefore, a creature’s “Destroyed:” ability will trigger as usual, before the creature gets purged by Annihilation Ritual. If an ability moves a creature to another out-of-play area that is not the discard pile (such as Bad Penny, Biomatrix Backup or Dextre) the creature would not be purged by Annihilation Ritual. If I discard a creature from my hand, does it trigger Annihilation Ritual’s ability? No. Your hand is considered an out-of-play area and a card in your hand is not considered in play. Therefore, Annihilation Ritual’s ability would not trigger and the creature would enter the discard pile as usual.